With a very eye catching design the 7 x 7 Traditional Summerhouse with Veranda is sure to be a very popular small summer house. While this is on the compact size, you actually get a little bit more floor space to play with than you would think. Add to this the lovely veranda and little decking area and you have a summerhouse where you can have a lot of fun or just spend time relaxing. A set of large double doors have been included so getting in and out will be no trouble. A generous amount of styrene windows are on the front of the structure to ensure you get a good flow of natural light inside. Thanks to the lock and key, anything you put inside here will be kept safe and sound. While this is one very stylish and classy looking small summer house, it is still very, very strong. The cladding is 12 mm thick tongue and groove shiplap cladding and it is backed up with a strong frame. The way this has been made is really going to ensure you get many, many years of use out of it. The solid sheet boarding floor is more than strong enough to handle the weight of chairs, tables and whatever else you decide to put inside. Here we have the 7 x 7 Traditional Summerhouse with Veranda which is one of the smarter looking small summer houses we have seen in quite some time. 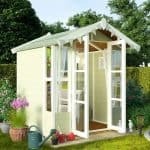 Ideal for those of you who do not have a whole heap of space in your garden, this summerhouse is compact enough that it does not take up a whole lot of room. The depth is 6 feet 4 while the width is right around 7 feet so you do have a little bit more room than you usually get with a smaller summerhouse. Along the ridge, you have 7 feet 2 inches of headroom which we really like and even the eaves at 5 feet 5 is not too bad either. We really like the overall look of this summerhouse and while it is classed as traditional looking. We feel that it does actually have a very modern and cool look to it. Clearly with its veranda the roof is a major highlight of this small summer house. Made with solid sheet boarding and then covered with high quality felt the roof is more than equipped to deal with whatever the weather throws at it. The veranda is great as it gives you a little shaded area to sit under. Now if we are being picky, we must say that we feet the boarding used for the veranda could have been made with a little bit easier on the eyes kind of boarding than the type they used. 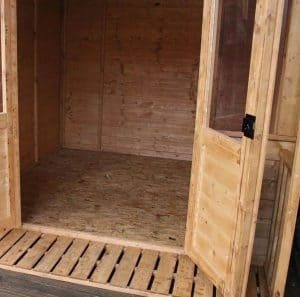 This though in the grand scheme of things is not a big deal, but it may be something you want to think about adding a covering to just to make it as attractive as the rest of the outside of the summerhouse. 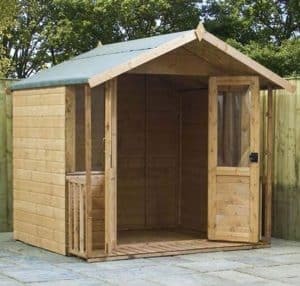 The 7 x 7 Traditional Summerhouse with Veranda is made with some very smart looking 12 mm thick tongue and groove shiplap cladding. We like this cladding for how it is incredible at keeping the rain out and the things inside dry, but it is also impressive in how smooth and modern looking it is as well. While they have not given the exact dimensions of the frame, our eagle eyes can see that it is most likely a 28 mm x 28 mm framing that is keeping this all together. This is the standard kind of frame for a small summer house. 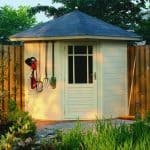 The compact size, solid cladding and the frame all add up to make this one very long lasting and solid summerhouse. On the outside there is a little bit of extra framing where the veranda joins the base. This keeps the veranda up and also adds a bit more personality to the outside of the summerhouse. Inside the summerhouse is the same solid sheet boarding that has been used for the roof. While it may not be the prettiest boarding out there, it does get the job done and if you cover it with a rug or even some cheap vinyl tiles if you are on a budget and it will look great. Outside the summerhouse there is a little decking area that is made with some very strong wooden boarding. We really like this and can just imagine you sitting out here with a glass of wine on a warm summers night. As the 7 x 7 Traditional Summerhouse with Veranda is only given a basic base coat of treatment before it is sent your way, you will want to give it a coating of wood treatment shortly after construction. A fresh coating should be applied on an annual basis. As this is a small summer house adding a coat of wood treatment will not take long at all so do not worry about it. As is the case with most other summerhouses that have a basic base coat treatment. As long as you look after the wood then you will be covered with a generous 10 year anti rot guarantee. The doors are fantastic. We really like the way the silver coloured hinges and large door handles really pop out at you. Using double doors was a great decision as it means you have 3 feet 9 inches of width and 5 feet 9 inches of height, so getting things like a table and chairs in will not require you to start twisting them around to do so. The doors have some very nice framing as well as some cladding along the bottom which we feel finishes them off just perfectly. The two doors both have good sized windows on them and alongside there is another window. These windows are a little bit smaller than the two on the doors, but they are made with the same strong and shatter proof styrene. Plenty of natural light is going to get into the summerhouse through the front. We do feel that they could have added an extra window to one of the sides, but we are sure if they did that then the price would have had to have been increased. We have seen a few other similar priced summerhouses, but the 7 x 7 Traditional Summerhouse with Veranda is one of the only ones that comes with a proper lock and key. First of all this will let you keep your belongings safely locked away, but it also means there is no need to add an ugly padlock. This is a small summer house that does actually offer quite a bit of privacy. There may be a decent amount of windows, but they are all located at the front so you can position the summerhouse so it is facing away from where people can see if you are worried about privacy or just want to strut around naked inside of it. Hey, it is your summerhouse and we are not going to tell you how to enjoy it. 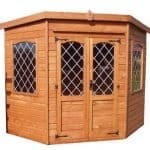 If you did want to put your own stamp on this summerhouse then the best way to do that is with the wood treatment. Before you settle on brown or clear, have a think about a more out there colour. You can get wood treatment in red, blue, green and all kinds of colours these days. There are not a whole lot of extras thrown your way. As a matter of fact the only one they have is an installation service. This is priced at £219.99 which we feel is very expensive so just roll your sleeves up and do it yourself! We are very impressed with this summerhouse and in general feel they have done a great job. At this price range, we really do not think they could have done a better job. This is a summerhouse that has been made to last a very long time. It will though need a little help from you in the form of an annual coating of wood treatment to keep rot and decay away. But structurally this is going to be just a solid 20 years from the day it was installed. 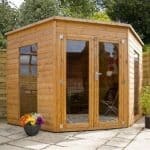 Most summerhouses that are classed as small or compact are 7 x 5, but this one does give you that little extra bit of space to make use of. Which can go very far when it comes to planning out your dream summerhouse. This is a pretty basic DIY job so hang up the phone on Tommy Walsh and just get a friend to help you install it. You are looking at 6-8 hours at the very most. 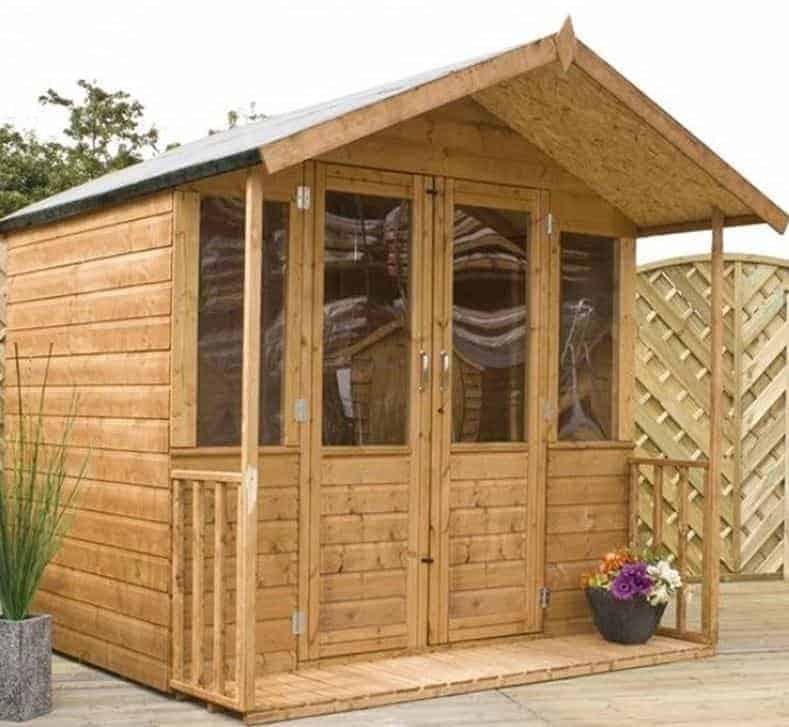 This is a little bit more pricy than some of the other compact sized summerhouses we have seen, but the veranda, decking area and that little bit extra space more than make up for it. Final Thoughts: We really like what they have done with the 7 x 7 Traditional Summerhouse with Veranda. This is one very smart and classy looking small summer house that we are sure you are going to have many happy years with. It of course has a fantastic look to it, with the veranda and decking area being major highlights. But it is also very well made so you are going to be able to make use of this for a very, very long time. 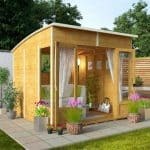 We see this as a great summerhouse for those of you who do not have a lot of free space in the garden or who do not want to spend a whole lot of money. 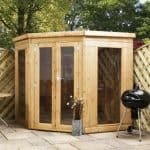 If you are looking for a summerhouse that is on the compact size, then this is one that has to get some attention.